Many developed economies are now moving toward less-polluting sources of power, with cleaner fuel sources and renewables making up an increasing part of the energy portfolio. From an ideal environmental standpoint, however, the pattern may not prove to be perfectly linear or optimally fast, as new sources such as “shale oil” and shale gas produced by hydraulic fracturing, or “fracking,” emerge as possible “bridge” fuels toward, or even detours from, a truly clean, low-carbon economy. Widespread use of fracking could boost U.S. shale oil production to 5 million barrels per day by 2017, research indicates, with total oil production rising from 11.3 to 16 million barrels daily. And “old” energy sources are never completely left behind: Coal’s share of U.S. electrical generation may have declined since it peaked in 2005 at 50% — but only to 45%. 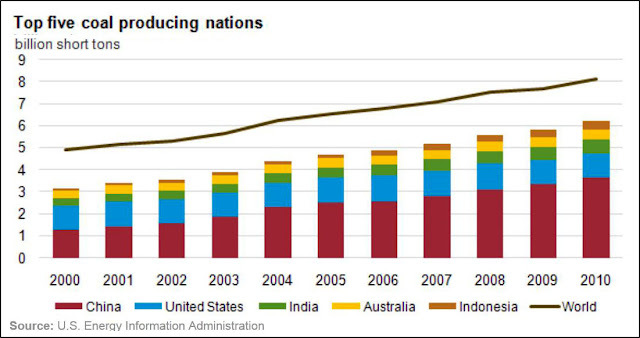 According to the International Energy Agency, global coal production has never fallen, and by 2017 it could become the number-one source of power in the world. It also produces 40% of greenhouse gas emissions worldwide. Coal-fired power plants are the largest source of airborne mercury emissions in the United States, according to the Environmental Protection Agency, and U.S. environmental regulations are relatively strict compared to those in many developing countries. A 2013 paper in the Annual Review of Public Health notes the high externality costs of burning coal for Americans: “Studies of the health costs of coal-derived electricity have yielded estimates ranging from $62 billion to $523 billion annually, or from 3.2 cents to 28.9 cents per kWh — at the upper extreme, several times the current cost of electricity in the United States.” Other research studies raise similar concerns, including: “Full Cost Accounting for the Life Cycle of Coal,” in the Annals of the N.Y. Academy of Sciences; “Uncertainty and Variability in Health-Related Damages from Coal-Fired Power Plants in the United States,” in the journal Risk Analysis; and “Committee on Estimating Mortality Risk Reduction Benefits from Decreasing Tropospheric Ozone Exposure,” published by the U.S. National Research Council. Despite such research, the relative urgency of moving away from coal as a significant source of power continues to be a hotly debated — and contested — political topic in the United States. Still, scientific evidence continues to build in support of making a faster transition to truly clean energy sources. For example, China’s air quality, long a concern both domestically and abroad, suffers in large part because of the country’s dependence on coal: The country produced nearly 3.5 billion tons in 2011, more than triple that extracted in the United States. Given the extreme toxicity of mercury and other pollutants released by burning coal, what might the long-term health consequences of the fuel’s use be? A 2013 study published in the Proceedings of the National Academy of Sciences (PNAS), “Evidence on the Impact of Sustained Exposure to Air Pollution on Life Expectancy from China’s Huai River Policy,” looked at the relationship between levels of coal use and mortality. The researchers, at Peking University, the Hebrew University of Jerusalem, Massachusetts Institute of Technology and the National Bureau of Economic Research, were able to conduct a “natural experiment” because of a Chinese law in force between 1950 and 1980: North of a line defined by the Huai River and Qinling Mountain range, the government provided free coal for home and office heating; to the south, coal had to be purchased. Mortality data was obtained from a set of 145 nationally representative sites that capture variations in the country’s wealth, demographics, urbanization and density. 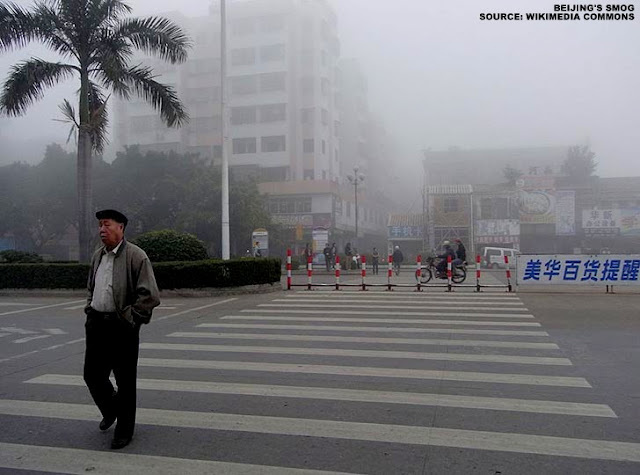 From 1981 to 2001, China’s level of total suspended particulates (TSP) was more than double the country’s standard of 200 micrograms per cubic meter and five times the prevailing level in the United States before the Clean Air Act of 1970. The Huai River policy led to TSP concentrations that were 55% higher (an additional 184 micrograms per cubic meter) north of the boundary line than to the south. North of the boundary line, life expectancies were reduced by an average of 5.52 years (95% CI: 0.8, 10.2) due to elevated rates of cardiorespiratory disease. Based on Northern China’s population of more than 500 million between 1990 and 2000, the Huai River coal policy led to a loss of more than 2.5 billion life years. “The [total suspended particulate] concentrations that prevailed during the study period greatly exceed the current concentrations in developed countries but are not atypical for many cities in developing countries today, such as India and China,” the researchers note. “These results may help explain why China’s explosive economic growth has led to relatively anemic growth in life expectancy. Chena, Yuyu; Ebensteinb, Avraham; Greenstonec, Michael; Lie, Hongbin. "Evidence on the Impact of Sustained Exposure to Air Pollution on Life Expectancy from China’s Huai River Policy," Proceedings of the National Academy of Sciences, July 2013. doi: 10.1073/pnas.1300018110. This article was first published at Journalist’s Resource under a Creative Commons Attribution 3.0 Unported license.